❑The System Administrator has control over who may access the Sybase SQL Database. •This is the database that contains all of the information stored in MKMS. •A person who has been given access to this file is called a System User (User). •Users entries (created using this Add/Delete Users form) provide control over who may Login to the MKMS Sybase SQL Database. ❑An Employee cannot access MKMS until they have been given a User Name and Password, and have been assigned to an Employee Group. ✓If you are using the Third Edition UL® 1981 Version of MKMSCS at your Company, see "UL® Password and Username Requirements" below and the "6.2 - Sign-on Security" section in the UL 1981 Third Edition Standard Overview chapter for more information about how to construct a Password. 1.Admin with a password of "admin". ▪Select ADMIN as the Employee and then enter a User Name and Password. oSee the "UL® Password and Username Requirements" discussion below! ▪Assign this ADMIN Employee to the appropriate Employee Group. 2.Operator with a password of "operator". ▪Add as many new operator type of Users as needed following the ADMIN instructions above. 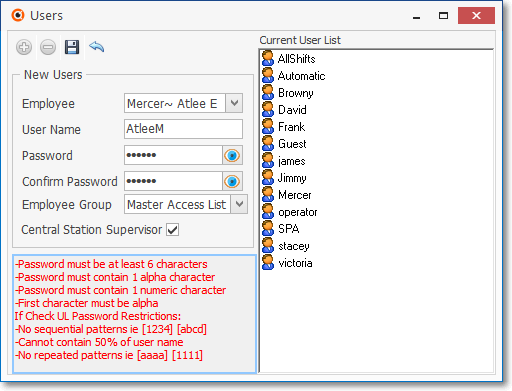 ▪For at least one of them, select Operator as the Employee and then enter a User Name and Password. 3.Guest with a password of "guest". ▪Add a new User following the ADMIN instructions above. ▪Select Guest as the Employee and then enter a a User Name and Password. •You may enter as many a User Name and Password combinations for your Company's Employees, as required. This means that you do not have to assign them a a User Name and Password for access unless they actually require database access as part of their job's responsibilities. c)Passwords that are simply letters or numbers in order (e.g. : abcd, 1234, etc.). •To enter Login information for an Employee and assign that Employee to an Employee Group:. ✓Access the Quick Access Menu System and Select the Security Menu, then Click Add/Delete Users. •Employee - Select an Employee using the Drop-Down Selection List provided. ✓The Employee may be an individual, or a generic sign-in for certain Employee Groups each of which have the same Access Rights. ✓In so doing you may set up a Login for Guests, basic Operators, clerks, etc. that have specific duties that match a predefined Employee Group's rights. •Password - Enter a Password for this User at least six characters in length. ✓See the "UL® Password and Username Requirements" discussion above! •Confirm Password - Repeat the previous entry. •Employee Group - Assign an Employee Group using the Drop-Down Selection List provided. •Central Station Supervisor - Check the Central Station Supervisor box, if appropriate. •Click the Icon on the Navigation Menu to save the User record. •For instructions on how to change the assigned Password, see Change Passwords. •Access the Quick Access Menu System and Select the Security Menu which will display the General option, then Click Add/Delete Users. •In the Current User List box, Click on the User name to be deleted. •Click Delete to remove the User name. •Answer Yes to Confirm the deletion. ➢Note:This process only deletes the User, not the actual Employee record. •To completely remove this Employee, you should also delete the Employee record. ✓However, in most cases, the Employee already has Financial, Monitoring and/or Service Transactions linked to it (Service Calls, Sales, etc.) and so cannot not be deleted. ✓Instead, in the Employee Form, you could simply enter an Ends date using the Drop-Down Calendar/Date Entry field provided which would automatically cancel that Employee's Login access and delete the User record on this Add/Delete Users Form.